I love myself a good story with royalty so.. you could say my interest was piqued from the get-go with this one. 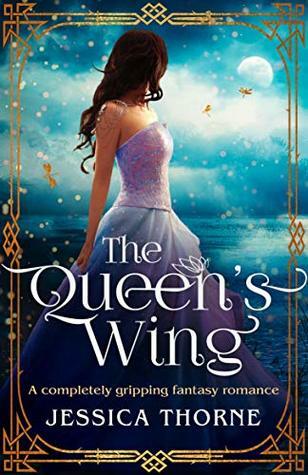 A girl, living for freedom, who suddenly has to give up everything in order to become the future queen? Yes, please! Give me that! I was, honestly, pleasantly surprised with the way I was drawn into the story right from the start. The way Bel shares how her passion is flying – in space, might I add – and her feelings regarding her position in her planet’s politics grabbed my attention and didn’t let go. Then the actual story starts pretty quickly – love that! This is no romantic event. No fairy tale. I’m a game piece on a vast board. Apart from the setting in space, there are also alien creatures introduced, I guess I should call them. Different races that have a place in the world Jessica Thorne created and I really liked that aspect. Especially since they weren’t “discovered” or anything like that. They’re simply a part of all the different races in existence. Might sound stupid, but most of the novels with aliens are books where aliens are very recently discovered? So this felt new and fresh to me. A smaller “good thing” but definitely one that has to be mentioned: There are some queer side characters! I was pleasantly surprised by that and loved how nobody seemed to frown upon it. Definitely a plus for this story. During the first part of the novel, I was totally enjoying one of my favorite tropes – sorry – which is the love triangle. Sort of. I was totally rooting for it and then.. something happened to make it all fall apart and things went downhill from there. To say I was disappointed when that trope disappeared in the most awful way possible is an understatement but it’s definitely not all. There’s one other thing I didn’t really struggle with at first, but.. half-way through the novel that changed as well. I’m talking about our main character, Bel, suddenly not feeling all that fleshed-out anymore. At first, it seemed to me she really had her own characteristics and knew what she wanted. She had the background and upbringing that fitted with her actions until.. it didn’t anymore? She started doing things that didn’t suit her character – at least in my opinion – and they never really got talked about that much either. I don’t want to spoil anything, but there’s one specific event where she’s all “soldier” while she never showed any signs of actually having a cold-hearted training like that. No clue if this makes any sense, sigh. I’m not even a person anymore. I’m a princess. Then there’s this issue I had with the writing. Not the writing in general – I honestly liked the dialogues and a lot of other things but when it comes to the action? Not so much. It wasn’t described as I would’ve liked. Some of the fights and situations Bel found herself in should have been so intense but they weren’t. On top of that, she got hurt at one point and I’m still not sure what exactly was wrong with her? It was.. never stated, as far as I remember? I also found it a pity how there isn’t more insight in Bel’s relationship with her lady-in-waiting, Elara. There’s some kind of evolution between those two, but it’s simply stated. You don’t actually see it happen and I really, really wish that was different! Not only that, it also happens with Conleith, her husband-to-be! Guess I can’t really.. say a lot of good things about this novel? It’s not that I disliked reading it, but there were so many things that could’ve been better. There’s potential, without a doubt, but.. this novel definitely needs a couple more rounds of editing before I could say I truly liked it. What’s most important to you when it comes to an author’s writing? The dialogue? The descriptions? The characters? Next ›TTT: Being thankful is not that hard! Definitely true! In this one the love triangle was.. totally ruined for me though. I don’t know. :’) Can’t really expand on it since it contains huge spoilers, haha.